For all the perfectly captured pics, tales of spectacular sights, and recountings of the joys of travel, there are about ten times as many behind the scenes mishaps, moments of boredom, long lines, and spending seemingly hours trying to find ANYWHERE and ANYTHING to eat. This is especially true when visiting China’s capital city, a city steeped in history, beauty, good food (but not apparently at major tourist attractions), bureaucracy, and waiting. Exhausted from our flight, adventures, and food tour, Amaury and I woke up late on Day 2 of our Beijing trip to find that our phone plans had stopped working. “I knew it!” I exclaimed to Amaury’s understandably grumpy face, “I knew our Guangdong plans wouldn’t work here!” It would have been more satisfying to be wrong. We’d exhausted all our data through unannounced roaming fees. Consequently, we spent the morning painstakingly mapping out our day on a hard-copy map in case we couldn’t find a China Unicom store to get a Beijing SIM. Cue lots of reminiscing from me about navigating France ten years ago with only a bedraggled map and a Nokia phone while Amaury did most of the actual work. For Chinese people, the issue would have been less frustrating. They could have logged onto the China Unicom website using their national ID and simply ordered Beijing minutes and data. Being a foreigner in China adds another layer of complexity and requires the kind of out-of-the-box thinking so often emphasized in sample job interview questions. 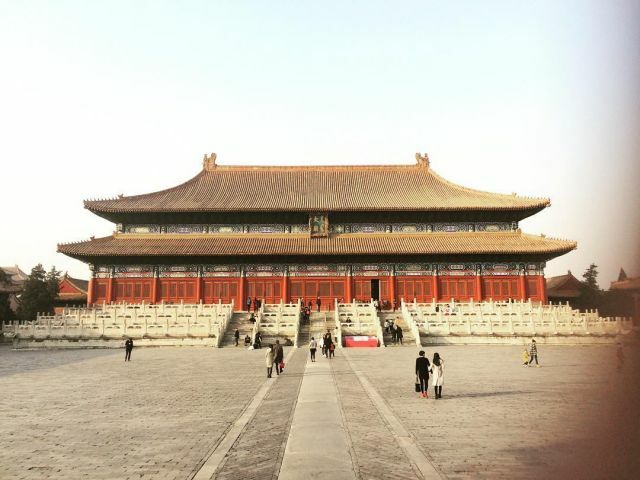 As such, we mapped out our route to a possible China Unicom store as well as to Tiananmen Square, the Forbidden City, and where we planned to meet friends for drinks and dinner in the evening. You never know here if a store listed online will actually be there, as it may have closed or never existed to begin with. It is in these moments working uphill against language barriers, questionable maps, and travel unknowns that I realize how much I love my husband. As much as visiting a beautiful site together is wonderful, our relationship grows stronger through the boring moments of problem-solving. Suffice to say, we found the Unicom store, successfully got a new SIM, and headed off on our sightseeing just a few hours late enough to miss seeing the Forbidden City that day. Having finally regained data on my phone, I wanted nothing more than to head straight to the mammoth line at Tiananmen to see famous things. Instead, I felt betrayed by my stomach and my migraines, since I have to eat at regular times lest I fall into a headache-inducing funk. After much walking around that tested Amaury’s patience and my ability not to melt into a hangry puddle of rage, we finally ate some cold chicken, cold vegetables, and lukewarm eggplant at a very friendly restaurant that thankfully was still open at 2:30 pm. The restaurant staff was quite curious about this strange foreign couple that could speak Chinese and wanted to eat lunch so late; the chef even came out and talked to us. Finally, bellies full and moods improved, we joined the security line to Tiananmen. Pro-tip: make sure to bring your passport with you to all major Beijing sites as they are required for entrance- thank goodness we’d brought ours along! Another hour of boring travel moments later, we emerged to look across the famous square and into the large benevolently staring face of Mao Zedong looking over the crowd of tourists, police, secret service, and military. Tiananmen translates to “the Gate of Heavenly Peace,” a gateway that is the first southern entry point into the Forbidden City. 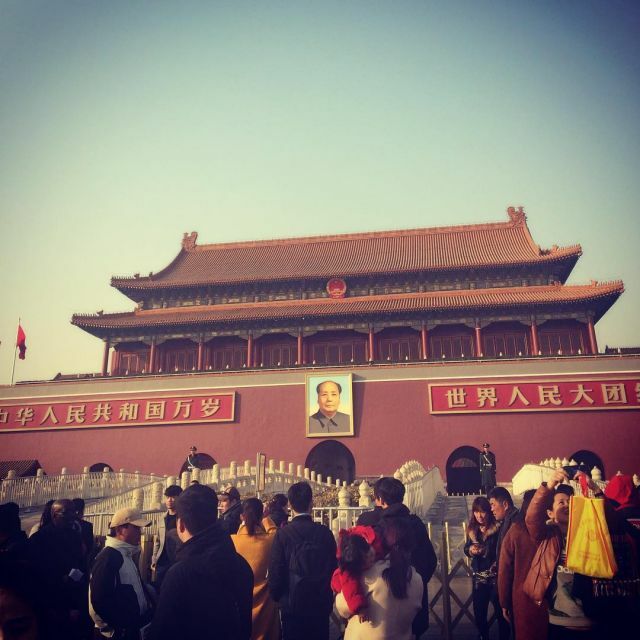 It outwardly faces a large square, workers’ statue, and Mao Zedong’s Mausoleum, a poetic juxtaposition of Old and New China, a feeling of being in two places at once. Most of the square part of Tiananmen was closed that day, but the chilling feeling of visiting the place was still strong. After snapping a few photos and craning our necks to look over to the Mausoleum, we decided to move on. We didn’t have time that afternoon to see the Forbidden City, as the ticket office closed at 3:30pm, so instead had a leisurely wander around the park to the East of the entrance. We walked through a barren wintry grove of trees, their branches splindly without their leaves, reaching up into the cold air that caused us to wrap up more tightly. My fingertips in fingerless gloves were small, red, frozen dabs of pain that assured me I was getting enough photos. Eventually, we came to tall walls that hid the sprawling Ancestral Temple. Its rust red walls and gray-brown roof probably contrast brightly with a summer day, but in the gray winter, it seemed to be a natural part of the landscape, a different kind of growing thing now dormant in the off-season. 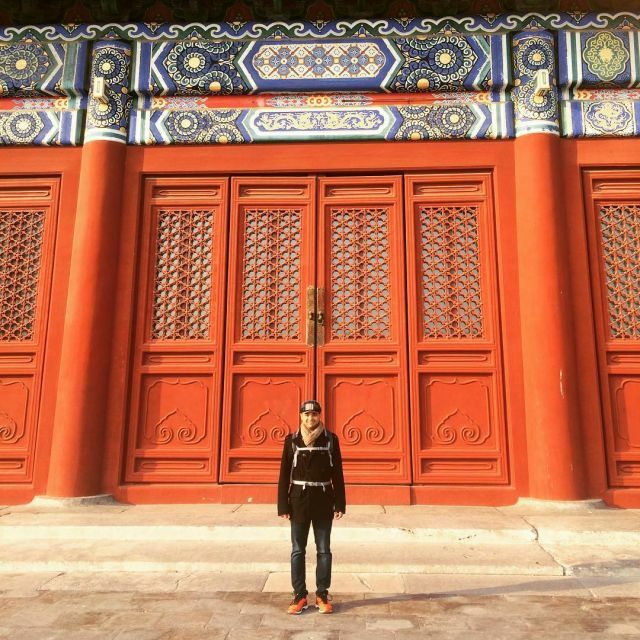 We wandered through the park to the entrance of the Forbidden City, its doors firmly closed. It seemed fitting that our first visit there emphasized its restrictions. For so many centuries, the peons of the city would have likely not even got this close to its imposing magnificence. A guard directed us back along the moat to exit and re-enter modern Beijing, Prada and Louis Vuitton presenting a different kind of inaccessible grandeur. 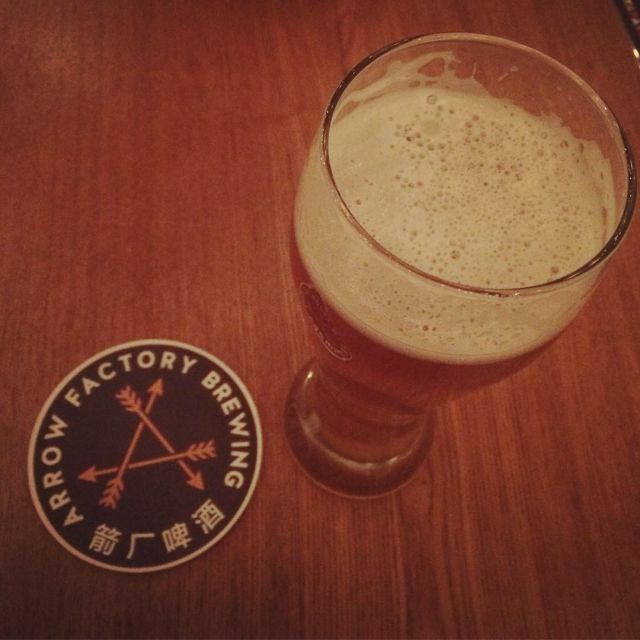 Finally, we stopped our trek and called up a DiDi to head to our next stop, the Arrow Factory Brewery. Turns out that Beijing’s brewery culture is booming. There are few breweries in Guangzhou trying to make a name for themselves, but Beijing appears to be several hops ahead (I went there). After savoring some tasty beers, we walked down the street to a Kao Ya (roast duck restaurant) to meet up with US friends we hadn’t seen since we all move to China. 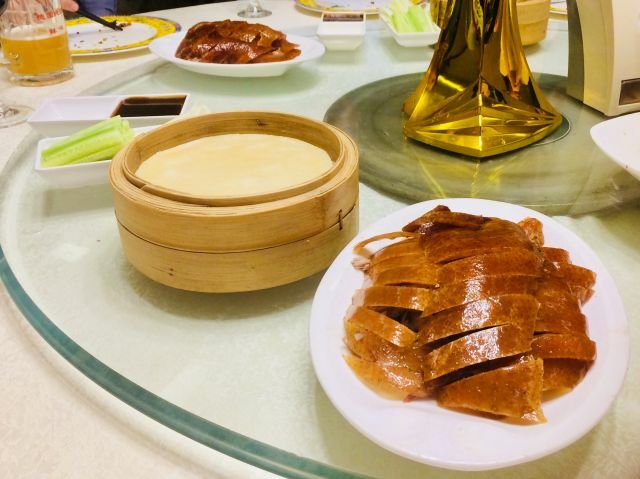 It was awesome to be back together and even better to be reunited over Beijing’s famously delicious crispy roast duck. Directions for eating Beijing Kao Ya: pick up thin tortilla-like pancake in one hand, pick up the crispy duck with chopsticks and dip into sweet, sticky, brown sauce and sugar. Gently lay duck into its pancakey bed. Add thinly sliced onions and cucumber as desired. Roll pancake, devour and weep slow tears into your plate of other tasty Chinese dishes as you savor its perfection. Sitting around the lazy susan, we swapped stories of life in China. Our friends had more tales of air pollution woe than us, though Beijing has been cracking down on coal burning, so the air has been steadily getting better. We commented on how many wai guo ren (foreigners) there are in the city. It seems a little harder to get out of the ex-pat bubble in Beijing. Beijing definitely grew on me during our trip and I wouldn’t be opposed to one day living there if that’s ever in the cards. At the same time, my heart is in Guangzhou. I couldn’t help raving about our hot and humid city, its food, its culture, its towering buildings, and its green trees. Hopefully they’re inspired to come down to visit now. All things considered, day 2 in Beijing was a great day. Low on famous sites, high on experience. I recently read an article on Anthony Bourdain’s approach to travel, which is essentially to get off the beaten track, experience the local culture, avoid tourist traps.